Talview has been conferred with an award for “Optimizing operations with AI” at Microsoft's AIforall Award on the 21st of November, 2018. The award was conferred upon Talview in an effort to recognize the organization’s contribution to the HR-AI industry. Talview was shortlisted for the awards due to its efforts in optimizing operations for its large-enterprise clients. With Talview, clients saw significant channeling in the recruitment funnel, ultimately leading to less candidate turnaround time. Talview’s platform is intended to streamline the process of recruitment and make it easier for both the recruiter and the candidate while keeping the cost of hire under control. Organizing and executing a campus drive is considered to be one of the biggest challenges in talent acquisition, keeping in mind the efficiency ratio in narrowing down the right talent. Campus hiring helps recruiters leverage the “crucial talent pool”- called so because of the abundant availability of “fresh” resources under a single roof and is highly competed for. One of Talview’s client companies conducted campus hiring drives in 200+ college campuses across India with zero on-campus presence and was able to process over 9000+ candidates on Talview, including 6,000 candidates in a span of 75 days during peak hiring season. On an average, Talview helps organizations save 7240 hours of panel time every year with the use of cognitive proctored assessments, asynchronous interviews combined with Talview’s Behavioural Insights module. These are used in screening and shortlisting rounds during their campus hiring drives. "While AI is a buzzword today and a lot of tools available in the market claim that they have AI, Talview has time and again differentiated itself from the rest by not talking but delivering AI for our customers. This award is yet another validation for how we have been able to put technologies like Natural Language Processing and Computer Vision in use for delivering disruptive business outcomes for our customers. ", states Sanjoe Tom Jose, CEO of Talview. “This recognition continues to validate the work Talview is doing for global enterprise organizations as the leader for AI in the HR Technology space. We appreciate the Microsoft partnership allowing us to optimize efficiency and effectiveness throughout the talent acquisition process for our customers”, added Matt Pietsch, CSO at Talview. "While there is a long way to go, we have left aspiring for or proving our mettle in this area far behind, and have established our leadership on AI in Talent Management with a singular focus on solving pain points for our customers. 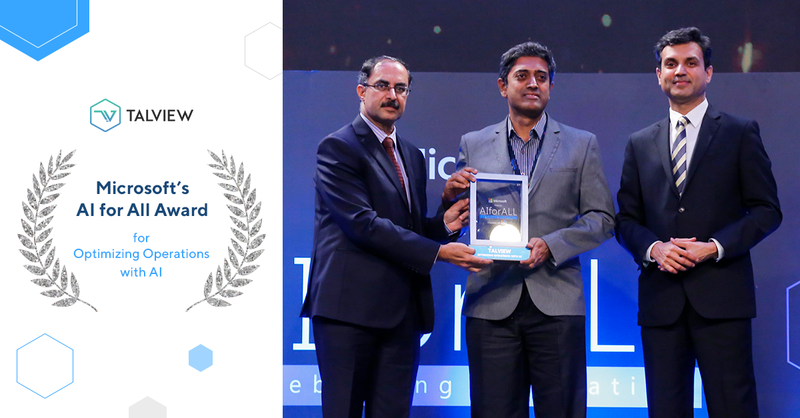 Thank you Microsoft for this recognition", concluded Rajeev Menon, Chief Product Officer, while receiving the award on behalf of Talview. Talview is a unified talent assessment and interviewing platform that helps large enterprises bring down the time to hire by up to 70% and significantly improve the quality of hire. This is enabled by our AI-enabled video interviewing, cognitive remote proctoring and advanced assessment solutions, that leverage the best in class NLP, Machine Learning, Computer Vision and Video Analytics capabilities. Talview is transforming the global talent measurement industry by automating and modernizing the talent assessment process for some of the largest organizations in the world. Founded in 2013, Talview now processes over a million candidates each year for clients in more than 100 countries across the world. Talview is designed to cater to the mobile-first internet user of the 21st century who is accustomed to virtual methods of communication by providing an exceptional experience. Talview integrates seamlessly into most ATSs and LMSs to help reviewers and administrators automate repetitive tasks so they can focus on selecting the right candidates. Talview is funded by leading Silicon Valley-based VC funds. Currently operating out of the United States, Singapore, and India, with its headquarters in Palo Alto.